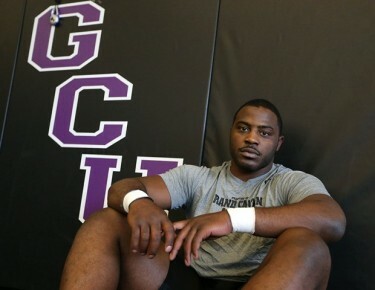 GCU heavyweight Tyrell Fortune manhandled opponents this season while compiling a 36-1 record and becoming the Division II Wrestler of the Year. Tyrell Fortune was admittedly apprehensive when he arrived at Grand Canyon University last August. The much-heralded heavyweight wrestler was away from his home state of Oregon for the first time, didn’t really know anyone and was far removed from his support system of family and friends. Now? He doesn’t want to leave. Not even if it means missing out on a chance to win a fourth successive collegiate national championship. “I’m not going anywhere,” said Fortune, a two-time NJCAA national champ at Clackamas Community College who followed that up this season with an NCAA Division II heavyweight title at GCU. “I like it here. We have a great coaching staff — we communicate every day. The trainers, the cafeteria people, everybody is great. … And the teachers really work with me, especially when they know you’re out there representing the University. I appreciate everything they’ve done for me. Fortune accomplished just about everything possible on a wrestling mat in his first season at GCU. He was the Super Region IV champion, an NCAA Division II national champion, the Most Dominating Wrestler at the national tournament and the Wrestler of the Year in Region IV while going 36-1 with a school-record 20 pins. On Wednesday, he became one of the most accomplished athletes in GCU history when he was named Wrestler of the Year for all of Division II by the Wrestling Coaches Association. For a YouTube video of Fortune’s highlights from this season, click here. Next year, as Grand Canyon makes the jump to Division I athletics, the Antelopes will be ineligible for the postseason. But even without the opportunity for a fourth national title, Fortune hasn’t wavered in his commitment to GCU. “Next year in the preseason, when we’re going through the grind and working out every day and we’re out in the sun and it’s 100 degrees and we’re doing sprints, that will be the hardest knowing there’s no national championship,” Fortune said. “But our biggest motivation will be the level of competition that we’re going to be wrestling. Coach (R.C. LaHaye) has us wrestling Iowa, at Iowa. That’s one of the hardest gyms to win a dual meet. That’s a message LaHaye – and every other coach on campus – is emphasizing to current athletes as well as high school recruits as the school goes through the transition period to Division I. “Tyrell really represents the approach we take with athletes,” LaHaye said. “He understands that even though there is no national tournament at the end of the year, that’s just one weekend you have to sit out. We try to get them to look long-term at what they want out of life and not just one weekend. Fortune works over Alex MacKenzie of Colorado Mines en route to a pin in 1:50 during their match Jan. 5 at GCU Arena. Fortune, who is majoring in psychology, would add an “amen” to that. “Education is more important than anything I do in wrestling,” said Fortune, who pursued wrestling rather than football in college because it offered him a full-ride scholarship. “Wrestling is just the vehicle that allows me to get an education. The way Fortune is headed, he’ll accomplish both. He’s on track to complete his degree next year. And on Wednesday, he traveled to Las Vegas for the U.S. Open to vie for a spot in the U.S. World Team Trials that take place June 21 and 22 in Stillwater, Okla.
His weight class of 264.5 pounds at the U.S. Open includes Tervel Dlagnev, who reached the semifinals of the 2012 London Olympics; Missouri’s Dom Bradley, who was a 2009 Junior World Champion; 2011 NCAA champ Zach Rey, who recently won the Pan American Championships; and a slew of former NCAA Division I All-Americans. The end goal, Fortune said, is the 2016 Rio Olympics. But even if that doesn’t come to fruition, other doors are opening. World Wrestling Entertainment (WWE) already has connected with GCU’s heavyweight. And others are interested in having him participate in the NFL Combine for draft prospects even though he hasn’t played football since high school. For now, Fortune is happy right where he’s at. Not only is he an amazing wrestler but he is an amazing person, takes no short cuts and works hard.